Having grown up on Earth, we tend to associate cloudy skies with brisk weather. Even gloomy weather. As Robert Frost said, if it’s the month of May and a “cloud comes over the sunlit arch” you’ll find yourself “two months back in the middle of March”. How different are clouds on alien worlds? Is there such a thing as searingly hot clouds, suspended high above in skies so bright they make your eyes ache when you shut them tight? 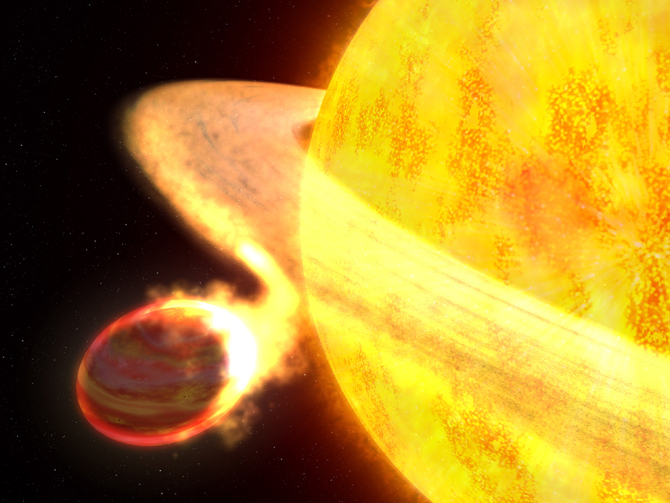 If we want to study alien clouds outside our own solar system, “hot Jupiter” planets are our best test subjects. Hot Jupiters are gas giant planets which orbit very close to their host stars. Their atmospheres are relatively easy to characterize if they pass directly in front of their host star [transit], which allows light from the host star to pass through their extended atmospheres and provide us with transmission spectra. The authors of today’s paper push the boundaries of knowledge into the most scalding area of parameter space: the realm of sizzling “super-hot” Jupiters, with temperatures of more than 1800 K. Part of the authors’ motivation is to address a longstanding puzzle. The temperature in most planetary atmospheres should become colder at higher altitudes. But according to models, hot Jupiters with very high incident flux levels are expected to harbor high-altitude atmospheric absorbers like TiO or VO. If these compounds are present, they will cause a “temperature inversion” where temperature actually rises with altitude. Strangely, however, these compounds or temperature inversions have been difficult to find in hot Jupiters. The authors begin by considering the hottest condensates that may exist in a hot Jupiter atmosphere: calcium (Ca), titanium (Ti), and aluminum (Al). They assume cloud formation occurs when rising air reaches vapor pressure saturation, and that clouds stop forming when one of the constituent elements is depleted. They calculate the resulting relative cloud masses, play around with the atmospheric metallicities, and overlay temperature-pressure curves on condensation curves to see what types of clouds should form. Among their findings, Al compounds will form much more cloud material than Ti, and higher atmospheric metallicity levels allow the formation of more massive clouds. The authors turn to the specific case of the planet WASP-12 b. The transmission spectrum of WASP-12 b exhibits some water absorption but is otherwise fairly flat, which indicates the presence of clouds. Fig. 2: Left: Solid colored lines represent temperature-pressure curves in different regions of WASP-12 b. After doing some more model calculations, the authors overlay condensation curves on a 2D plot of temperature as a function of pressure and longitude. Interestingly, the clouds roasting in WASP-12 b’s atmosphere start to form right around the regions accessible to transit spectroscopy. At temperatures of less than 1900 K, WASP-12 b’s clouds can shroud the signatures of TiO or “hide” its constituents via condensation. There still is much work to be done in understanding clouds among the worlds that “favor fire“. Condensation nuclei and condensate growth are very poorly constrained, and more lab work is needed to determine the optics of different compounds. But there is light on the horizon (again no pun intended). 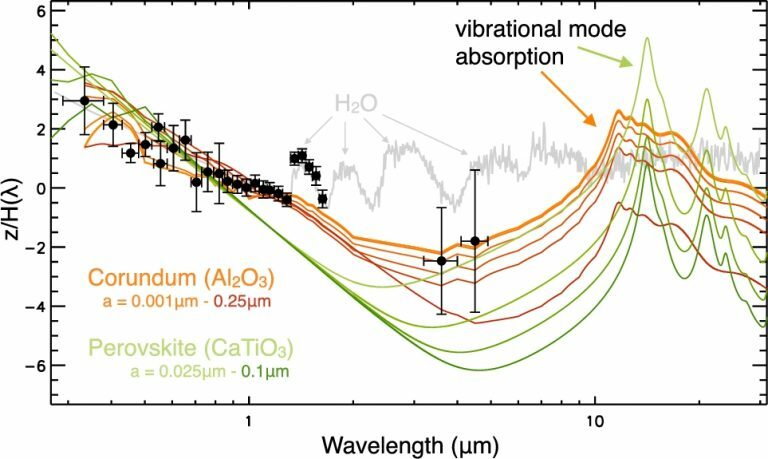 Certain absorption bands including Ti-O vibrations are within the discovery space of JWST, which may allow us to distinguish between WASP 12 b clouds which hide TiO or remove Ti from the gas phase. That would bring us full circle: after predicting the compositions of clouds on super-hot Jupiters, today’s paper has left us with a test observation to disentangle the effect of clouds on WASP-12 b. That test will get us another step towards resolving the mystery of the missing thermal inversions.